ME2 might still be a cover-shooter action-RPG, but the most of the basic mechanics are completely turned on their heads. 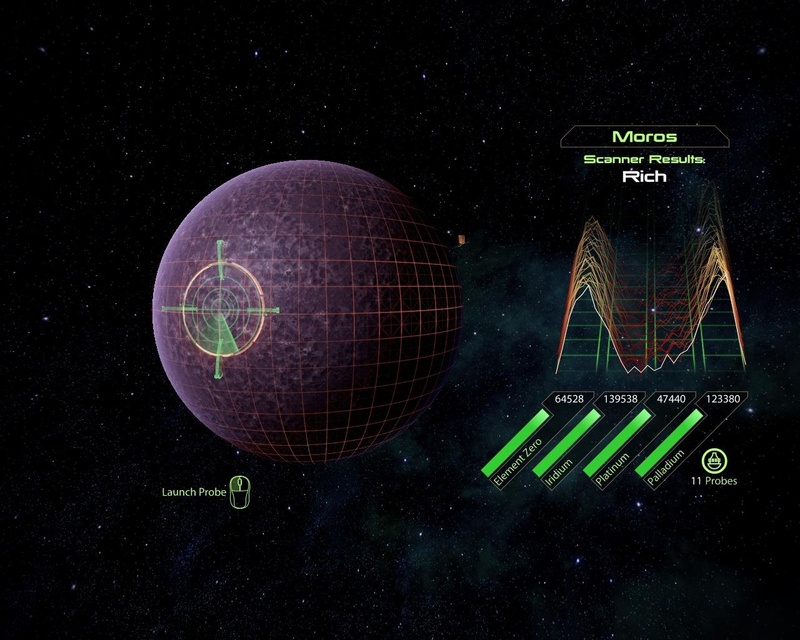 In the first game, the only currency of character advancement is experience points. Experience points buy levels, which buy ability points, which you have to spend for each character. The witty aside here is that, by and large, experience points are provided by murdering people. Therefore character advancement is almost entirely predicated on how many people you’ve killed. Since enemies don’t respawn, they cannot be ground (grinded?) and so your advancement is effectively gated by your progress through the game — sure, you can swap a few bits around and branch here or there, but by and large you’re getting better at a precisely portion-controlled rate. I seem to remember having an important point to make regarding that, but it’s slipped away. Ah well, let’s continue. Umm… Are you sure that sentence means what you think it means? Geth out of my way! The big difference between ME1 and ME2 is that you don’t spend money on passive upgrades anymore, like a gently-increasing slope of accuracy and damage (or you do, but that’s for later). No, it’s more like Warcraft III‘s ability system — you spend points on your hard skills, with only one passive track, rather than the old mixed skill lines that gave passive increases until a few set ability improvements. I used to be less than charitable about ME2 being an RPG. It’s much more of an action game, yes, less stat-driven and ostensibly less complex, but it’s not as much less of an RPG as I might previously have said. I always play Shepard as a massive alcoholic. It’s not wish fulfilment, it’s just normal. Mind you, those passive tracks are actually still there, they just use a currency other than Shepard’s kill count nowadays. Four currencies, in fact: four currencies that must be strip-mined from random planets with engagement levels worthy of any microtransacted bookface game. Conceptually, I love resource gathering (for some reason), and even though it’s pure drudgery I find myself continuing to do it because I love watching the numbers go up. Despite having researched every possible upgrade, I have over a hundred-thousand in everything except Element Zero. If the Collectors resist too hard, I can just pelt them with strategic metals. The fact that these passive upgrades were all hidden in the research terminal made me previously consider them as something other than RPG skills — and yet, I now find myself drifting ever towards this more physically meaningful method of advancement that is quite apart from experience points. As I’ve begun to rant about nowadays, these upgrades are not just things that happen randomly — you have to go out into the world and find them, whether it’s from shops or junk at the side of the mission path, before you can actually research them. Sure, they’re never hard to find and there are no hard choices to make between which ones to get (at least, unless you never mine anywhere and can’t afford them), but they are dressed up as tangible technological upgrades rather than random bonuses that magically turn on. So yeah, I actually like that. More action-adventure than traditional RPG, sure, but we’re arguing semantics now. If it feels good, do it. Now we have to talk about ammunition. I like ammunition. It’s another kind of currency, whose ebb and flow between different kinds of weapon can completely change the way you play a game. 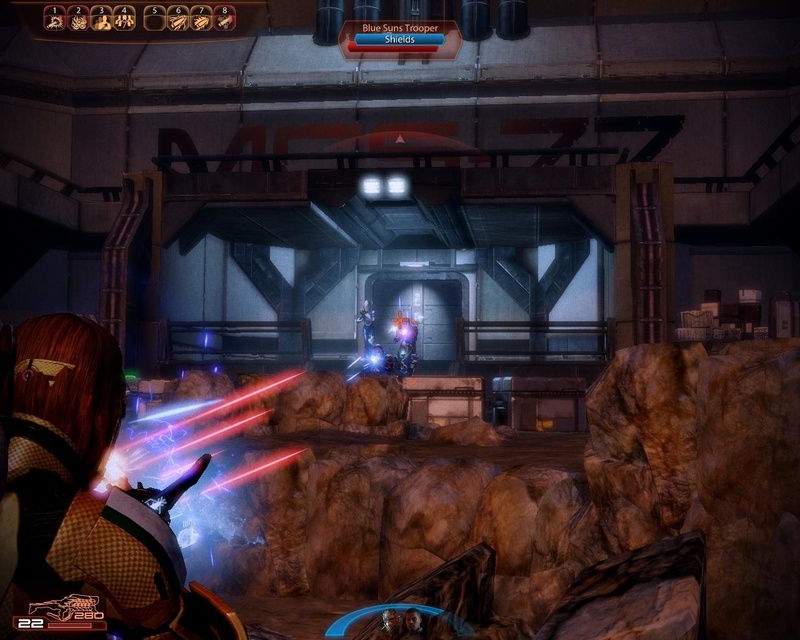 Take Unreal Tournament, and compare the experience of playing Shock Rifle with playing Flak Cannon. When you run out of ammunition for your favourite gun, it pushes you out of your comfort zone — either you need to get better at conserving, or you have to make do with something else. 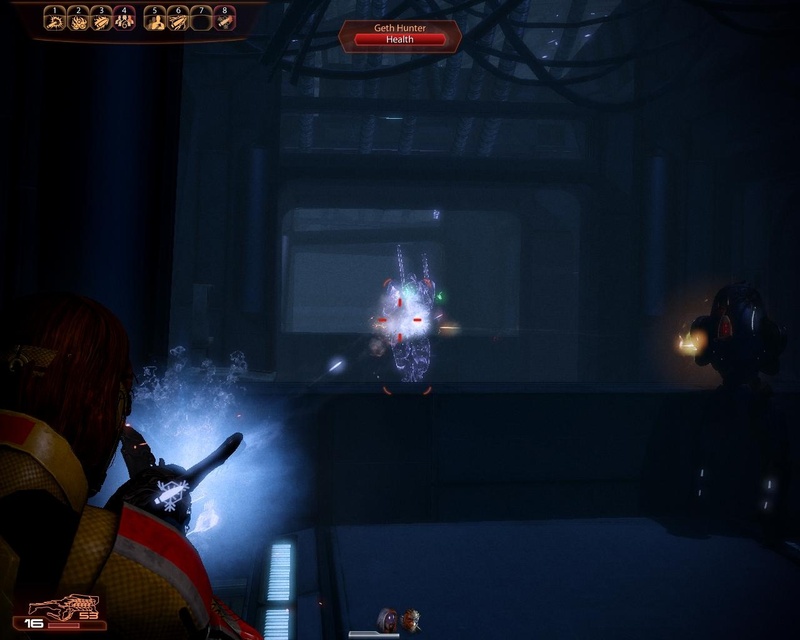 Mass Effect 2 swapped from the infinite-ammo overheating weapons of its progenitor to ammunition-based weapons. Sort of. Heat sinks are weird. They’ll fill up whatever gun your holding first, then fill up the stacks for your other guns, so the same units are common to all weapons. For a start, that means you’ve got ammo for one, you’ve got one ammo for all — it’s Invisible War all over again. Or is it? 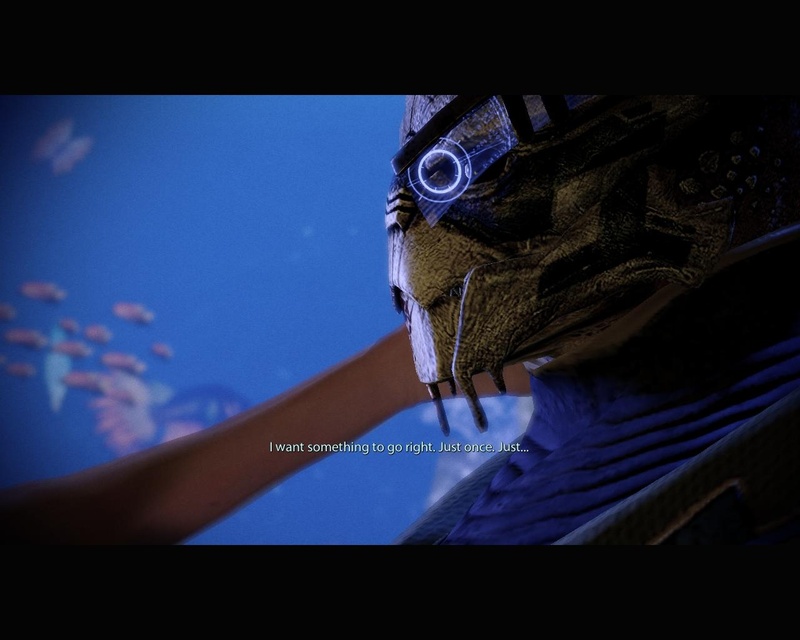 You and me both, Garrus. The strange thing here is that, lore aside, there are distinct ammunition stacks. You have no way of controlling which ones fill up when, but the weapons are gated seperately even though it’s by the same currency. So once you’ve emptied your assault rifle, if you haven’t found more sinks you’ve got to swap over to something else. Fair enough? Except then they made the mistake of not giving you a fallback weapon. Unreal has the Dispersion Pistol, Quake II has the blaster, Deus Ex has a panoply of melee weapons, Daikatana has the titular sword — there’s always something, no matter how weak, to keep you going when all else fails. 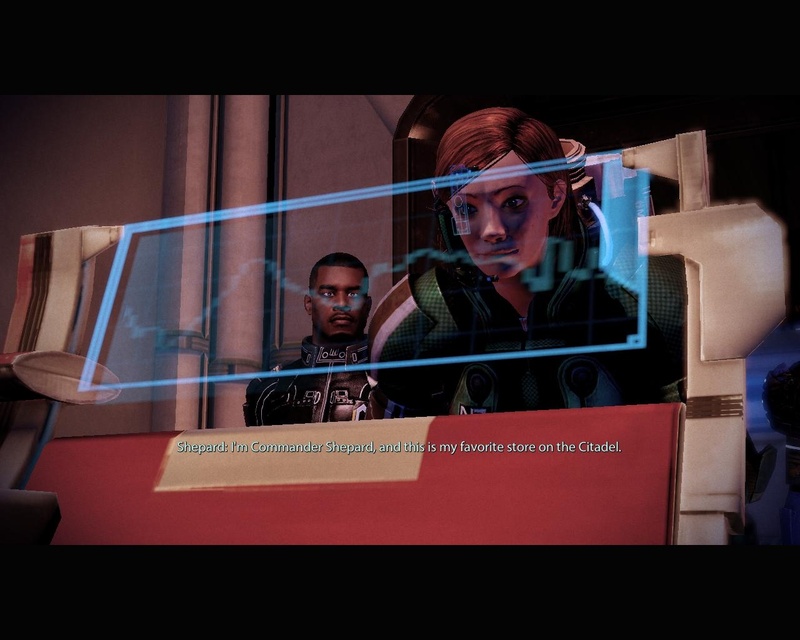 Not so in Mass Effect 2. 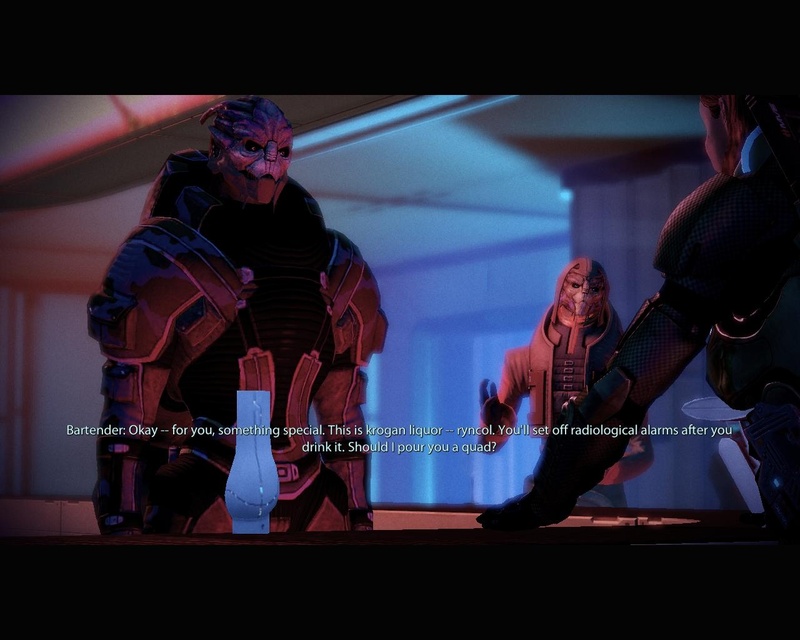 I love it when you talk dirty to me, Garrus. Which means the level designers cannot let you run out of ammunition. Run out of ammo and you’re dead, because melee attacks are basically useless (at least for the third game they realised this and tried to do something about it). So there’s ammo stacked everywhere, little piles of heat sinks that spontaneously respawn when you’re not looking (and when you are looking). Since it’s a cover shooter, you can hole up next to one of these stacks and be all set for an entire fight, for all weapons. All of which makes ammunition… slightly meaningless. It’s the interplay of supply and demand that makes currency have actual value, right? At least the guns do fire actual projectiles this time. Don’t worry guys, you can learn all the lessons we got sorted in the late 90s some other time. Gosh, it sure is convenient these rocks all formed neat chest-high barriers! Could they not at least have made you choose one store to make your favourite, rather than letting you lie to all of them? Sorry, I thought this was a choice-and-consequence RPG. 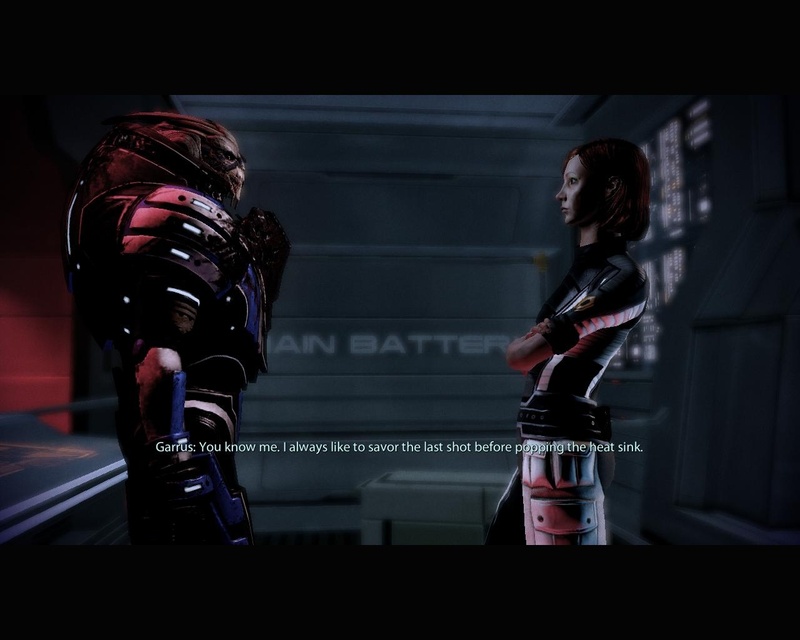 I guess the main problem I always had with Mass Effect 2, and the main problem that I still have, is that it’s far too divorced from Mass Effect 1. You spend some time beating up isolated Cerberus facilities, only to discover they’ve got infinite money, huge space stations and parade around the galaxy in uniform. You spend all your time fighting Saren, Sovereignn and the Geth, only to discover Sovereign had an army of super-techno-insects waiting in the sidelines that he never used. You spend all your time shooting guns with infinite ammunition and slathering omnigel on everything and then you die and get resurrected and it’s all changed. It’s not a bad game, but it is 12 or 13 miniature space soap operas rather than a cohesive whole. 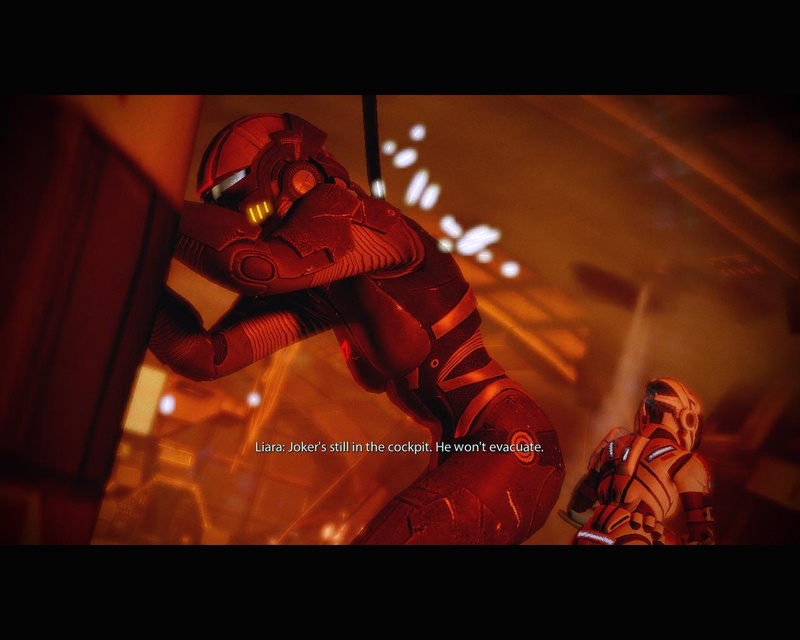 The overarching narrative is unsatisfying and contrived in often unnecessary ways, and no amount of belter lines from Garrus or Joker can mask that. You’ve got to reap just what you sow, and they sowed a stinker with this finale. 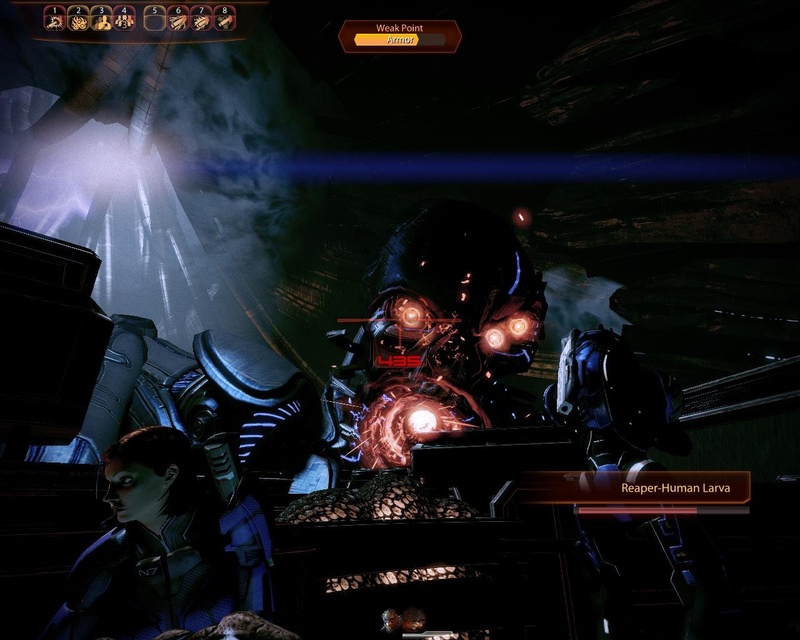 This entry was posted in Gaming and tagged action, ammunition, bioware, Cover shooter, games, gaming, garrus, harbinger, heat sink, Krogan Testicles, Mass Effect, Mass Effect 2, RPG, Shepard by Rao Dao Zao. Bookmark the permalink.